Data and Goliath - Description | W. W. Norton & Company Ltd.
Data is everywhere. We create it every time we go online, turn our phone on (or off) or pay with a credit card. This data is stored, studied, bought and sold by companies and governments for surveillance and for control. "Foremost security expert" (Wired) Bruce Schneier shows how this data has led to a double-edged Internet—a Web that gives power to the people but is abused by the institutions on which those people depend. 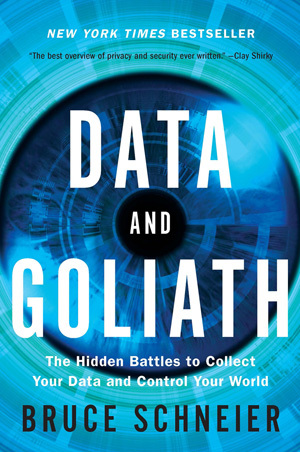 In Data and Goliath, Schneier reveals the full extent of surveillance, censorship and propaganda in society today, examining the risks of cybercrime, cyberterrorism and cyberwar. He shares technological, legal and social solutions that can help shape a more equal, private and secure world.